Chocolate & Rose Tea?!! It'll be love at first sip!!! One bag of our brand new Turkish Delight Tea, plus a bag of our old favourite Dark Cocoa Tea and a handy no fuss infuser. Service rating : Delivery was very slow - it took a week to arrive despite paying for first class postage and living in the same country. No response on instagram although I understand there is a contact email address which I didn't use so I can't really complain about lack of contact. There was no... Service rating : Delivery was very slow - it took a week to arrive despite paying for first class postage and living in the same country. No response on instagram although I understand there is a contact email address which I didn't use so I can't really complain about lack of contact. There was no estimated delivery date or any confirmation on the shipping date so I had no idea when to expect the package or how to know if it had been lost in the post. Product : I was really impressed with both of the flavours in this set. Despite ever trying them before, they really paid off and I will be replacing them once they are finished. This set was also great value with the infuser included, which is of a high quality and fits well into most of my mugs and teapots. Excellent products, great service and fast delivery, would highly recommend and will definitely be ordering again. Thank you! 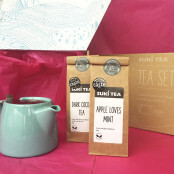 Got the tea - and my wife and I love the Suki teas!